With the news that Robert Mueller has a copy of the original letter on James Comey’s firing written by Trump aide Stephen Miller and Trump himself, we need to return to the great mystery of that lost hour on the tarmac on Air Force One. What am I talking about? Well, with a touch of dramatic flair I’m talking about this odd and increasingly odd over time mystery about what was happening the night President Trump came back from his Bedminster villa after a weekend of stewing about James Comey and then fired Comey 36 hours later. At the time, it just seemed like another Trump era weirdness. Air Force One landed. Jared got off the plane, put Ivanka and the kids in an SUV and then got back on the plane. And then Trump and a group of his closest aides were apparently arguing on the plane for about an hour while the traveling press cooled its heels and wondered what was going on. They never got an explanation. But after about an hour a rather disheveled President Trump got off the plane and went back to the White House. Who was there on the plane with Trump? Stephen Miller. 4. 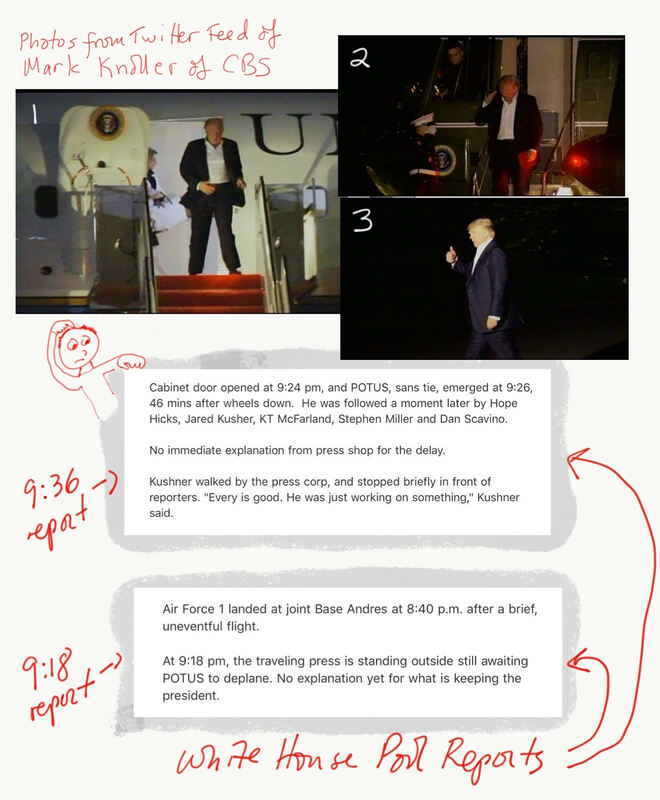 What happened that Sunday night on Air Force One? What am I talking about? Let’s look at the timeline. We know from abundant reporting that in early May (May 6th-7th) President Trump spent the weekend at his golf resort in Bedminster, New Jersey. He apparently stewed over that weekend about Comey and came back to Washington Sunday night determined to fire him. He proceeded to do just that. He called in Rosenstein and Sessions the next day (Monday), got Rosenstein’s recommendation memo and promptly fired Comey on Tuesday (May 9th). This we all know. But that Sunday evening return flight from New Jersey was also the night something kind of odd happened. Air Force 1 left Morristown at 8:02 PM and landed at Andrews at 8:40. But unlike what normally happens, the President didn’t get off the plane. Just before 9 PM Jared and Ivanka got off the plane with their kids. Jared put Ivanka and the kids into a silver minivan and got back on the plane. He got off the plane again at 9:07 and then got back on the plane a couple minutes later. The press pooler for that night filed an update at 9:18 PM updating colleagues and noting that there’d been no explanation what the hang up was or why the President was still on the plane. Finally, at 9:24 PM the cabinet room opened and the president emerged. Here’s the pool report filed a few minutes later. Hicks, Jared Kusher, KT McFarland, Stephen Miller and Dan Scavino. No immediate explanation from press shop for the delay. Here’s a mini-collage I put together the next evening (Monday evening), along with photos posted to Twitter by Mark Knoller of CBS news. Not a great deal got made of this after that evening. That’s understandable and largely correct. Any number of things could have happened. Maybe they just wanted to finish a meeting. Maybe the President was eating or needed a bathroom break. It was only 45 minutes. Let me also clearly bound my own questions and speculations. I don’t think anything horrible or shocking happened in that 45 minutes. But given the oddity of the event and the fact that Trump returned to the White House and immediately put in process one of the most consequential decisions of his presidency – firing Comey – I think it is highly, highly likely that the two things are connected. As you can see from the pool report, Trump was traveling with what I would call five of his most aggressive and enabling advisers: Hope Hicks, Jared Kushner, KT McFarland, Stephen Miller and Dan Scavino. We know from subsequent reporting that Kushner was a major proponent, perhaps the most voluble proponent of firing Comey. I strongly suspect that the hold up was some on-going discussion, perhaps a heated discussion, of the decision to fire Comey. However that may be, I think Kushner’s role in all of the entire Trump/Russia story is bigger and more central than most of us have understood. One day will find out what happened in that 45 minutes. And I’ll be happy that day.